The Rev. Dr. David Esterline serves as president and professor of cross-cultural theological education at Pittsburgh Theological Seminary, a position he has held since June 2015. Before coming to Pittsburgh he served for 18 years at McCormick Theological Seminary—for 10 years as dean of the faculty and vice president for academic affairs and then as professor of cross-cultural education and ministry. He earlier served as mission co-worker with the Presbyterian Church (U.S.A.), first at the Theological College of the Presbyterian Church in Cameroon and then as academic dean and Lecturer at Pacific Theological College in Suva, Fiji Islands. Dr. Esterline currently serves as chair of the Executive Committee of the Global Forum of Theological Educators and on the Executive Committee of the Board of the Foundation for Theological Education in South East Asia. He has extensive experience in accreditation of theological education, first with the South Pacific Association of Theological Schools and, for the last 20 years, with the Association of Theological Schools in the United States and Canada (ATS). His publications and research include The Handbook of Theological Education in World Christianity (ed., with Dietrich Werner and others), Building Beloved Community: Multicultural Theological Education (ed., with Ogbu Kalu), and the Global Survey on Theological Education, 2011-13 (with Dietrich Werner and Todd Johnson; forthcoming). He holds degrees from the University of California, Oxford University, and the Graduate Theological Union (Ph.D.) in Berkeley, Calif. Dr. Esterline was ordained to the ministry of word and sacrament by the Presbyterian Church of Cameroon and is currently a minister member of Pittsburgh Presbytery, Presbyterian Church (U.S.A.). He has served as a missionary in Cameroon and Fiji. He’s been a seminary professor and dean as well as a parish minister in the United States and abroad. He’s long worked to diversify theological education and promote cooperation across denominational lines. Now the Rev. Dr. David Esterline applies that experience as president and professor of cross-cultural theological education at Pittsburgh Theological Seminary. Ordained by the Presbyterian Church in Cameroon in 1987, “Dr. Esterline is well-known in global theological education,” said Board Member Emerita Sandy Lamb. “He knows the standards and the composition of a good seminary. He’s a great listener. He’s a great convener. He’s a serious person, but he has a wonderful wit.” He started his ministry as a Presbyterian Church (U.S.A.) mission co-worker in Cameroon and the Fiji Islands. In that capacity he served as a lecturer at Theological College, Presbyterian Church in Cameroon, and as academic dean, lecturer, and chair of the Biblical Studies department at Pacific Theological College in Suva, Fiji Islands. Dr. Esterline previously served as the director of the Institute for Cross-Cultural Education at McCormick Theological Seminary and was the dean of faculty and vice president for academic affairs at McCormick from 1999-2009. He also served on the faculty and as director of the Doctoral Program and Continuing Education. In all those roles he shaped McCormick and the wider church in distinctive and crucial ways. For example, there and in the PC(USA) more widely, he has become a leader in raising awareness of white privilege and racism and in providing guidance and instruction in what it means to live faithfully in a multi-cultural church and society. Dr. Esterline researches, writes, and lectures internationally about Christian theological education worldwide. The Handbook on Theological Education in World Christianity, which he co-edited, is the definitive and most comprehensive study of global theological education available today. He is co-chair of the recently formed Global Forum of Theological Educators, an initiative designed to provide a common table for international fellowship of leaders in theological education from every Christian tradition. 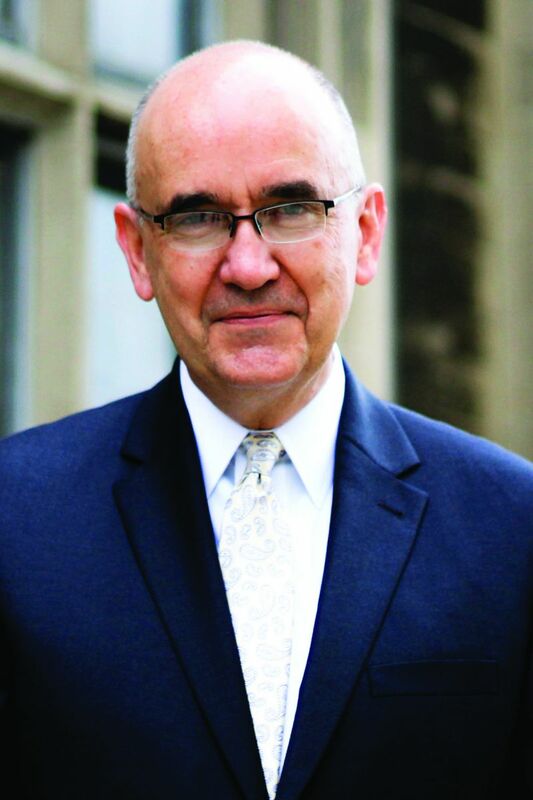 And he has worked extensively with the Association of Theological Schools, the accrediting body for more than 270 institutions in the United States and Canada that is headquartered in Pittsburgh. He has also served with the World Council of Churches focusing on ecumenical theological education.